It's been a wet weekend (in the way that the prelude to Noah's flood was wet) but in-between showers we got a day out in the country. The Scottish one wanted to visit Kirby hall in Northamptonshire, much of it's a shell now but still in a very grand and Elizabethan way - it was used as a set for 'Mansfield Park' (which is the vaguely literary connection). It's a stunning place particularly if you have an interest in architectural history and garden design, the advantage of it being a ruin is that you can see how the building was constructed without the distraction of 400 years of interior design covering it's bones. However despite the impressive building and grey skies the thing that really impressed me was the huge flock of peacocks (apparently the collective noun is an ostentation) and the noise they made along with the very vocal rookery that surrounds the hall. I spent a lot of time trying to stalk peacocks in which I would have been entirely unsuccessful if they hadn't been quite tame, quite thick, and unable to see what's going on behind them when there tales are spread. The peahens, very dowdy in comparison, have a much more intelligent gleam in their eyes and were singularly unmoved by their menfolk's display. On the way back from Kirby we saw another English Heritage sign as we passed through Lyddington - this was for Lyddington Bede house, originally a wing of the medieval palace of the Bishops of Lincoln, but an almshouse from 1600 up to about 1930. This building is pretty much whole but stripped to the bone, the rooms directly under the slates of the roof are particularly lovely - huge unexpected spaces full of their years. The bedesmen's rooms are small but not unappealing, we both managed to find one we felt wouldn't be a bad place to end our days in (if a monastic and possibly damp lifestyle appealed). It took me a few minutes to realise what a bede house was (in our defence we were thinking about the venerable Bede and the bishops palace) but when it clicked I was in Trollope's 'The Warden' Lyddington isn't Barchester, although there were complaints against the warden misbehaving in the 1890's, but this must have been exactly the sort of building he had in mind and it really bought the book to life. The day ended in Uppingham with tea, cake (very good cake) and a visit to a serious antiquarian book shop. Lots of lovely folio society copies (which were very reasonably priced) and then another league of book - I had half an eye on a 6 volume set of Virginia Woolf's letters from the Hogarth Press. If I liked Virginia Woolf more (at all) and had £300 it would have been very tempting. The Scottish one was eyeing up something in Latin which was the size of a table and priced at £2000 - it seemed like a good time to go home. 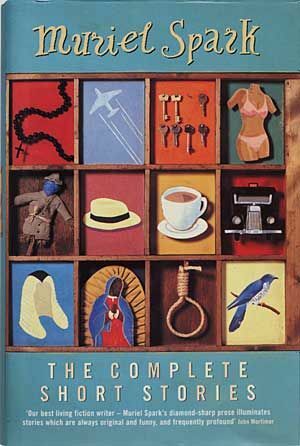 I haven't completely read the complete short stories; there are quite a lot of them and I don't want to end up feeling like I've had to much of a good thing, or perhaps more to the point find somewhere past the middle that I've stopped noticing the nuances in each story. 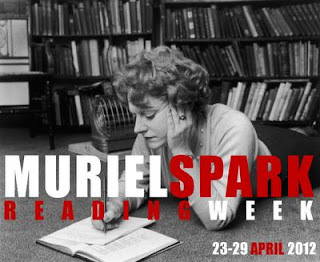 Instead, and as it's been Muriel Spark week, I've been dipping in and out as time allows and think I've ended up with a pretty good over all impression of Spark as a short story writer whilst still leaving myself with plenty to look forward to for future reading. A recurring theme of this week has been a general sentiment of 'this isn't Spark's best book, but...', it was my own reaction to 'Territorial Rights' - well 'The Complete Short Stories' contains Spark in all her moods and forms. A witty, playful, sometimes cruel writer the short story suits her and for anyone newish to Spark this is the where I'd suggest you go after the inevitable 'The Prime of Miss Jean Brodie'; it's a very good place to get to know her. So far the only one I haven't liked was 'The Thing About Police Stations' which was set in an almost Orwellian dystopia and I found somewhat baffling. At entirely the other end of the spectrum was the really charming 'A Hundred And Eleven Years Without A Chauffeur', in which an elderly woman finds some of her family photographs have gone missing including one of an aunt by her sewing machine who had always wanted a Rolls Royce. They turn up again having been pinched by an ersatz Baron in search of some ancestors but meanwhile he's doctored the images and the long gone aunt ends up immortalised with the Rolls she always dreamt of. I can honestly say that this is Spark at her best (if you only buy one Spark book make sure... etc.) it's also a book that's going to be rescued from the neglected spot at the back of the bookshelf that it's been hiding on to be sent to a new home somewhere more prominent and generally handy for bed time reading. Symposium from January 2011 - I should have read a Spark this New year -that was the beginning of a fine tradition that could have seen me through the next two decades if I'd kept it up. These are all the Virago reissues and all come heartily recommended. It's also definitely time to re read 'A Far Cry From Kensington' which I came across pre blog and is the book responsible for my Sparkian infatuation. 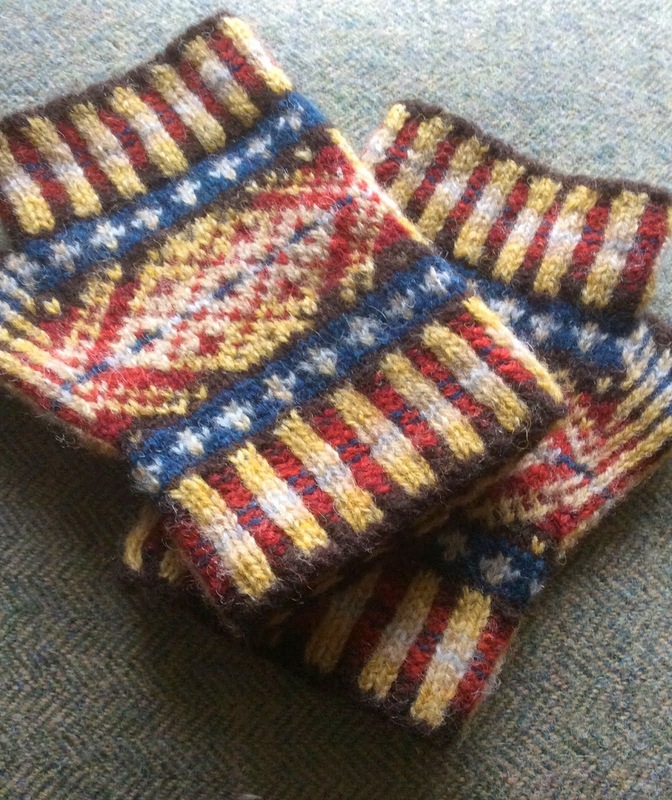 Better late than never - here's my contribution to Muriel Spark reading week. It still surprises me to find how much she wrote; at least 22 novels (looking at Simon's list there are still a few I hadn't heard of before) and then there are all the short stories and not so short stories. 'Territorial Rights' was a second hand find - I don't think it's destined to be a reprint any time soon, it isn't really Spark at her very best despite anything the cover blurb says to the contrary, and this is the first thing that interests me about it. As someone who reads a lot of 'Classics' previously neglected or otherwise I'm always curious about the process that goes into rescuing a book from obscurity, I've loved all the Spark titles that Virago have reissued, and was of course bowled over by 'The Prime of Miss Jean Brodie' (inevitably the first Spark I read) and so would be inclined to automatically buy anything I saw with her name on it because until now I've been inclined to think she couldn't put a foot wrong. In the general way of things we only get access to the best of an older authors work which in turn serves to bolster there reputation. 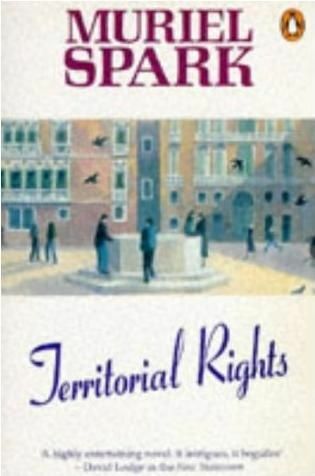 In Sparks case the reputation is deserved, 'Territorial Rights' isn't by any means a bad book it's just not as good as some of the others. Everything is a bit of a mystery - Robert has arrived in Venice ostensibly as a student and most likely in pursuit of a somewhat older Bulgarian defector Lena, she's in Venice to find her father's grave. Hot on his heels follows Curran an American millionaire art collector with whom Robert has been living with for the past two years. As chance would have it Robert's father (Arnold) and mistress check into the same hotel he's staying in, a situation Robert finds intolerable seemingly because he just doesn't like his father very much. Meanwhile back in Birmingham Robert's mother, Anthea, has had enough and has called in the private detectives. Their woman on the ground in Venice is Violet, an old friend of Curran's, the detectives make their money through blackmail. Add to this mix Grace (a friend of Anthea's and ex lover of Arnold's) and Leo (a vaguely Jewish young man) who follow Arnold to Venice on Anthea's behalf, and then there are Katerina and Eufemia the two sisters running the hotel. Lena's search for her fathers grave is the catalyst that reveals the links between these people but Lena herself is not a sympathetic character. This is the second thing that hooked me into the book - Spark takes the characters I felt I should have empathised with and makes them appalling, instead she gifts her should be villains with the sympathetic traits. The anti -Semitic Lena who throws herself into a filthy canal to cleanse herself after sleeping with Leo is the prime example of this. She's made ridiculous, often cruelly so, but one cannot help but feel she deserves her punishments (mostly) and I'm curious about what Spark meant us to make of her and why specifically she makes her anti - semitic, it's such a loaded and specific way of making someone dislikeable. Beyond that it was a quick and generally enjoyable read, a book I'm pleased to have finished, but probably one that's going to make it's way back to a charity shop. It lacks something that the other Spark's I've read have most definitely had; I'm almost certain it's a specific narrative voice - all the Spark's I've loved have been told from the point of view, and in the voice of, individuals. The characters in question might be morally ambiguous but they've generally been excellent company, I missed that insight here. Little Toller Books continue to be the find of the year, nature writing can be a tricky thing - I have a stack of books I've failed to get very far with, books without humour but heavy on philosophy and written in an overly lyrical style (books that shall remain nameless here because they deserve no sort of encouragement), but when it's good you can find a book that changes the way you look at the world. What Niall writes about is his personal Eden - North Clutag farm, as it was when tenanted by his grandfather. Sent there as a boy in the 1920's to escape an outbreak of meningitis in Glasgow it becomes the place where he spends every holiday as he grows up learning the landscape intimately as he does so. The young Niall was a keen poacher so his days are filled with illicit trips into the woods and over the moors in search of every sort of game from eels in the burn to pheasants for the pot. Nobody can know a patch of land like a man whose spent hours hours observing a gorse bush to see where exactly under it a bird has her nest. He knows the rat runs in the farm, where the stoats live in the dry stone wall, and where to find a plovers nest. This is a boy who kept pet hedgehogs and disgraces himself by shooting an owl, one who'll find himself half way across a field before he's really woken up - and only then by the crack of his shotgun after an early rabbit. He's also a man who understands the importance of a whole ecosystem (though that's not the word he uses) and the need to maintain balance within it. 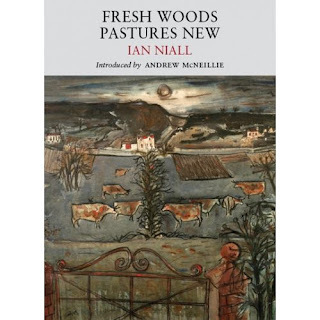 'Fresh Woods Pastures New' is in part an elegy for a way of life already over by the time it was written - by the 1950's tractors would surely have been the norm, rather than horses, to do the heavy work; a way of farming that had to an extent accommodated wildlife fast being replaced by mechanised efficiency and pesticides. Niall doesn't often explicitly condemn modern methods - for the most part he ignores them choosing instead to recall the past, but he does mourn the loss of woodlands, though even when he does this he manages to avoid being sentimental. This is a book bathed in nostalgia but always grounded by the presence of a shotgun and an awareness of the food chain. Niall writes beautifully, and according to his son with very little editing or revision - this I can well believe the book reads like a man reminiscing in conversation. It's attractive but calls for sustained concentration - this wasn't a book that I could read for hours, without a narrative my attention wanders and when I'm reading about nature it generally wanders straight out the window to look at a tree or similar - which is part of the pleasure. After reading 'Island Years Island Farm' I ended up buying three copies as presents, by the end of the year it will probably be more, 'Fresh Woods Pastures New' has the same quality - it makes me long to share it with other people. In the early 80's my sister and I used to go and stay with our mother in Edinburgh. it was the first place I saw a film in a proper cinema, was taken to the theatre, saw a ballet, ate French bread, and had really good ice cream. Scotland doesn't do badly for gelato - even Aberdeen had Casa Marchini (they sold wonderful ice cream and were really the high point of my second year at university when I lived just down the road from them). The love affair with gelato continued when mum and made a trip round Italy, ostensibly I was there to look at as much art as I could see in a week but it turned into an ice cream eating marathon (especially in Venice where between us we ate an epic amount of the stuff) but since that trip I've searched in vain for something even close. You can buy excellent ice cream from any supermarket these days but I've yet to find a anything like a satisfactory vanilla gelato that would transport me back to Edinburgh aged 9 eating the best ice cream sundae I'll ever have. Well if you can't buy it you can try and make it so ever since I got an ice cream maker a couple of years ago I've been looking for a recipe that will approximate the taste I remember - it's been surprisingly difficult. Most recipes I've found are based on a custard which is clearly not the place to start (I like custard, quite possibly more than the next person, but I don't care for it frozen) anyway long story short I bought the 'Dri Dri Gelato' book a couple of weeks ago - it looked promising - and started experimenting. The second attempt however is divine, I used a bit less milk and a bit more cream. I didn't bother at all with vanilla pods going for extract instead, and as I added it to the churn rather than when I was heating the milk and cream the result (that I hadn't thought through) is that the very small amount of alcohol has stopped the gelato from freezing rock hard. I also cut down the sugar slightly. What I didn't do was accurately measure the amount of milk or cream I used. or vanilla extract. This is a massive fail, and whilst I've learnt my lesson regarding note taking, I will just have to hope I can recreate (and share) the magic. Meanwhile I've got a small amount of very good ice cream (not for sharing) and hope! There will be more about the gelato book when I've tried more recipes. Next week is Murial Spark reading week over at Stuck in a Book and Harriet Devine's Blog and I'm quite excited about it, I've sorted out all my unread Spark's and am wondering which way to go with them. 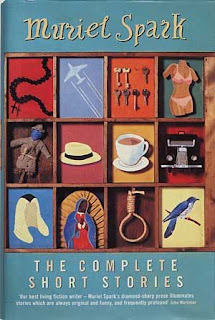 My Everyman's Library collection has a couple of unread novellas in it 'The Only Problem' sounds tempting. 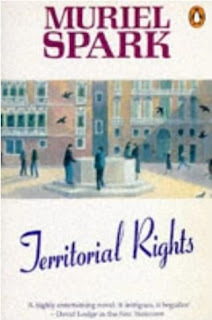 'Territorial Rights' is set in Venice - enough said really, and then there's the short story collection. I do like short stories and if I were to be organised could perhaps write about a whole lot of them through the week (I will never be that organised). 'Findings' was a revelation of a read for me. Generally when a book absorbs me I'm happy to go along with it without really wondering how the trick is done, with Jamie it's different, possibly because of the things she manages to convey without explicitly writing them. 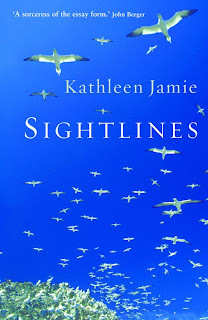 'Sightlines' is in many ways more of the same, a companion volume to 'Findings', and I very much hope that in the fullness of time there will be another. If there's a difference it's that I felt 'Sightlines' was more thematic, but perhaps it's that I'm now far more familiar with Jamie's style because on reflection 'Findings' contains all the same motifs. Perhaps the difference is that just as we know her better now she in turn knows us her audience, and what we need from her. I don't want to repeat myself too much but I think it's worth saying again that as with 'Findings', 'Sightlines' makes me feel I'm having a conversation. Each chapter has me rummaging through my own experience looking for connections, it's absorbing and deeply satisfying. On this reading though there are two things I've been particularly mulling over. The first is in a chapter about an archaeological dig, a cist grave is opened and later Jamie writes a poem about it ("No-one noticed if he opened his eyes,/acknowledged the dark,/felt around, found and drank/ the mead provided,/supposing himself dead.") she talks then for a little about how thrilling finding her way as a writer was, but what really brings it home is the revelation that the body in the cist was female, the thing is that if she had written about a woman it would have read as a metaphor about herself and that isn't what she wanted. It's a moment in the book that demonstrates the craft behind it and as such felt quite intimate. He or She - on the page it's one letter more or less but enough to entirely change the meaning of what we're reading - now that's something to consider. 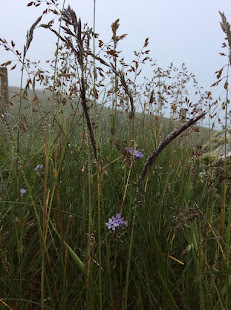 The following chapter is called 'The Gannetry', there is a visit to Noss in Shetland on a midsummers day with Tim Dee - it's a well documented day because Dee also wrote about it in his book 'The Running Sky' and contributed the chapter to 'Archipelago' and I'm quietly pleased to have read both accounts. Different writers with different preoccupations seeing some of the same things in the same place. It's another chance to see the craft involved. Dee describes the whales as bringing "up the wet of the deep on their backs and showed it to the sky and the auks and the gannets and us. Then they rolled forwards like dark planets bowled under the sea." Jamie's killer whales: "With a slow sea motion they rolled up, fin first, then backs so broad the seawater spilled off on either side, then we saw their nearsides, a medley of white and black. As those those three tilted back down in unison..." The same but different. Another section - 'Three ways of looking at St Kilda' (why are people so fascinated by those particular Islands?) should probably be required reading for anyone with a tendency to get carried away by images of romance and wilderness - both exist but never quite how you might picture it. The Scottish one sailed to St Kilda a few years ago and thought it beautiful. Listening to his account though, and now Jamie's, I find that it's basically inhabited - there's an army base and a warden as well as sundry researchers throughout the summer, and it gets a lot of visitors. A lot. 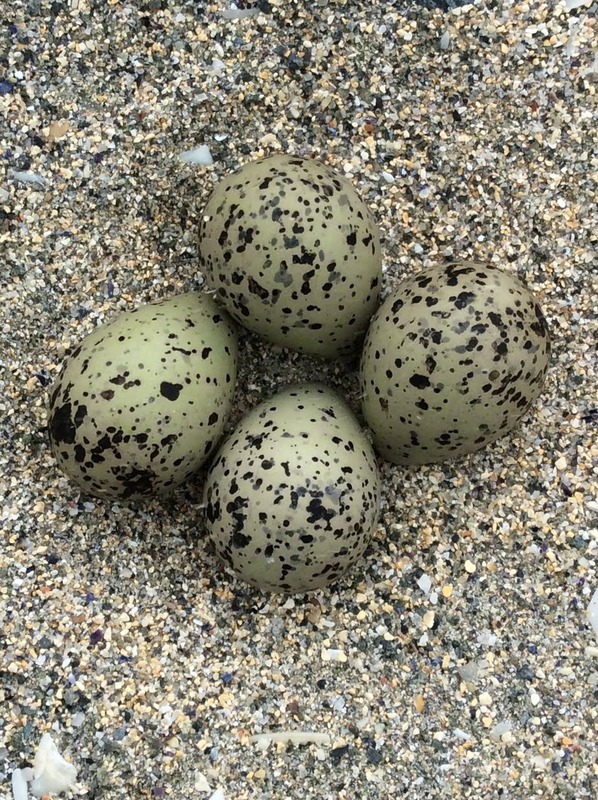 I felt slightly cheated having imagined a deserted place where landing would be a transgression almost akin to disturbing a grave or stealing from a nest, and not a tourist attraction. 'Sightlines' is dedicated for the island goers, more often than not it looks North and to sea. 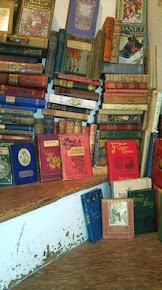 The lure of islands is habit forming (I have an ever increasing shelf of books on the subject to underline this). They are places to be sought out, explored, known from shore to shore, and returned to - I think the same description covers this book. Not my birthday but the blondes and I wanted to bake something special for her. She spent some time in Austria so Sachertorte was my first thought but I've baked that before and as this was really about having an excuse to go for broke with a really indulgent recipe I wanted to do something new (it didn't occur to me for a moment to consult my dearest friend about what she might actually want). After some serious time with the baking books (I was like a pig in mud) I found a recipe for Tyrolese Schokolade Torte in Geraldene Holt's 'Cakes'. Perfect. Not only an Austrian theme but also quite unlike anything I've ever baked before. It calls for a buttered and lined 23cm spring clip cake tin and an oven set to 180 degrees C or gas mark 4. When that's sorted you need 150g of fairly finely ground hazelnuts (mine were a bit to ground I think) and 150g of finely chopped plain chocolate (I didn't chop as fine as I would a second time) prepared and set aside. Next 5 eggs need to be separated, the yolks beaten with 150g of pale muscovado sugar until it's light and fluffy at which point the chocolate, and nuts should be folded in along with 1/4 of a teaspoon of ground cinnamon and about half as much of ground cloves. Finally the egg whites need to be whipped until fairly stiff and gently folded into the rest of the mix (I found the mixture really stiff at this point so beat some of the egg white in to loosen it up a bit before folding in the rest of the whites). After that stick it in the tin, smooth it down, and bake for 45 mins or until a skewer comes out clean. After it comes out the oven allow to cool for a couple of minutes and then release from the tin and leave to cool. To finish off and decorate warm a couple of spoons of apricot jam and brush over the top of the cake (nice and thick) then make a plain chocolate ganache (175g of plain chocolate and 6 tablespoons of double cream gently melted together until smooth) cover the cake (again nice and thick) and leave for a couple of hours to set. The book says it's better made the day before you want it which is just fine, I thought the overall effect was rather like the jammy-in-the-middle-chocolate-on-the-outside-lebkuchen that I used to love and haven't been able to find to buy for the last couple of winters. The chocolate stays in chips (which is good) and the nuts give a great texture. One of the oddest ghost stories I've ever heard concerns a pair of haunted shoes and there relationship with Papillon Hall. Legend has it that a wicked lord of the manor back in the eighteenth century kept a Spanish mistress prisoner in the house and that with her dying breath she cursed the house. If ever her shoes left terrible things would happen. Over the years the shoes left a few times, apparently every time they did things went bump in the night until they were returned. It was bad enough to ensure that the shoes were eventually kept behind an iron grill above the hall fireplace (for more details see here). 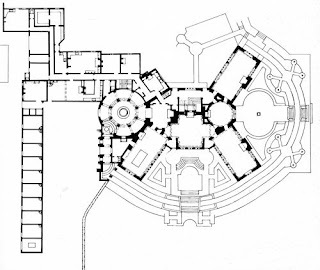 In 1903 Lutyens was called in to renovate the hall (his workmen soon came to believe in the curse) he turned the existing octagonal building into a butterfly plan and fortunately it was reasonably well documented in Country Life (here I would dearly like to pinch these images but suspect Country Life would take a dim view, do take a good look at the lilly pond picture) because in 1950 the house was demolished. 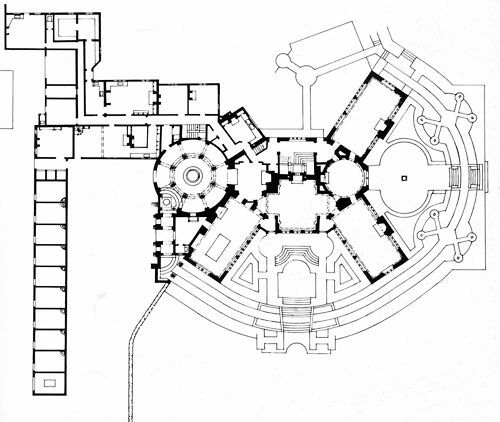 The floor plan for Papillon appears in a few text books so I was familiar with it both from an architectural perspective and from the ghost stories and have wanted to see it for an age. I got my chance today thanks to the Scottish one exercising his academic credentials and hitching along with The Leicestershire and Rutland Gardens Trust. I knew the house was gone,(the sight is on a farmyard and access is dependant on the good will of the farmer, he's lovely but this is not a public sight) but had assumed there would be visible foundations, perhaps a course or two of bricks. There isn't. The lilly pond is still there and at first glance that's it. Careful prodding around revealed bits of stonework and tile, possibly the dining room fireplace, and the end of the billiard room gable. There was a bit of brickwork on the ground identifiable from one of the Country Life pictures which was very exciting and a few other tantalising clues, but for the first time I really understood how much of our architectural heritage we lost in the aftermath of the second world war when unaffordable country houses were knocked down wholesale. There are scraps of documentation left, (Country Life again and a few memoires from people who had the foresight to realise there was something worth recording) but so much has gone forever and 60 years or more after its destruction it's slipping out of our collective memory that these places ever even stood. It makes me wonder what else was out there. 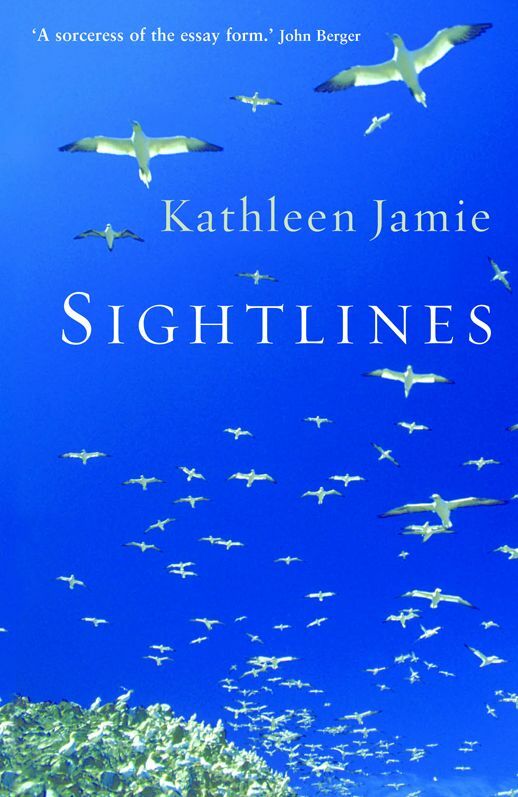 I've not long finished Kathleen Jamie's 'Sightlines', it's excellent and thought provoking as was its predecessor 'Findings' and needs altogether more attention than I feel I have in me on a Friday night but one of the places mentioned in passing was Sumburgh head in Shetland. 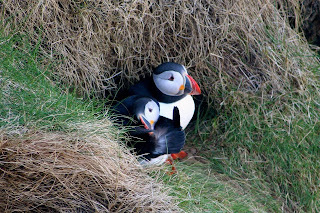 It's become something of a tradition over the last few years to start a visit home by going to see the puffins at Sumburgh (puffin cam went live tonight). The puffins arrive in April and stick around for a few months of summer before heading back to sea, May is probably the best time to see them but there should still be a few hanging around in July when I'll be looking for them. There are other places to see puffins close up but Sumburgh is my favourite, it's the southern most tip of Shetland and very handy for the airport which is a couple of miles below. You don't have to be feeling fit or able to get there, you don't have to think about ferries or time, and a few minutes up there is enough to blow away the generally mucky feeling travel of any sort leaves you with. The first time the Scottish one came north with me he was grumpy and tense on the flight (as if being dragged up to his girlfriends fathers house in the middle of nowhere wasn't bad enough there was the threat of unruly teenage siblings, and I think my mother might have been teasing him about the possibility of packs of dogs and shotguns...) so instead of taking him straight home we took a slight detour and went up the hill - it was a wise move. Car parked next to a field of exuberant sea pinks, a face full of very fresh air (and quite a bit of rain) and a puffin was enough to start the holiday on the right footing. (He's been back a few times now.) Last year when I was in Shetland whilst he was stuck at work, again the first thing we did was go and look for Puffins (even my sister who I was with, and who is highly hill averse was reasonably willing). Sumburgh has a good mobile phone signal (which isn't true of everywhere in the islands and certainly not true of my dad's house) so it seemed timely to call and rub it in a bit - to do this I found a specific square of concrete and waved like mad at a webcam (god knows what any other viewer hoping to see puffins made of it). I could have made a fool of myself in town but it wouldn't have been the same. In the end we all waved whilst talking on the phone, I dare say there are all sorts of conclusions about the modern world to be made from that, but at the time it was fun. Apparently there are frequent whale sightings from up there too, though I'm not a frequent visitor and have never hit it lucky. There is a stone shaped a bit like Darth Vader which you can't miss (it's just by the road and looks better in life than in the pictures but do Google it). There are other birds to see as well, plenty of rabbits, a Stevenson lighthouse (where I think I was taken as a child to see the lamp when it was still manned) but the big thing for me is the view. If you look north you can see Shetland spreading out in front of you looking surprisingly like it does on the map. The only other time I've had that sensation is flying over Bordeaux and seeing the Gironde below me - familiar but new at the same time. Look south and there's a lot of sea and sky (a lot), on a clear day there's Fair isle on the horizon and that's about it which is incredibly invigorating. Turn away from the miles and miles of bugger all ocean and it's back to contemplating the airport and a few yards beyond the runway some serious archaeology. After Leicester I prefer the sea and all that space, Leicester doesn't lack good archaeology and we do okay for industrial buildings too, but it's not easy to get a lot of sky or horizon in your view. The weather continues to be pretty grim, I've been out in the country for a couple of days where at least the rain has made the everything look perky and green, but back in the city the tiny green patch in the car park outside my window has been weeded. There is one lonely tree and something spiky left and as they whip around in the wind whilst rain spatters the window it's not a very cheerful picture. It's possible that the prospect of being back at work tomorrow combined with an overdose of Easter chocolate this afternoon are contributing to a general feeling of dissatisfaction with the world, that and I've just finished a really enjoyable book and wasn't quite ready to leave it. I came across Grant Allen in 'The Penguin Book of Victorian Women in Crime', it was such a good short story that I added a couple of titles to my wish list and bought a 'An African Millionaire' a couple of weeks ago (at bonus time - very dangerous moment). The copy that arrived is a lovely floppy American paperback, I was lucky to get it, it now shows as only available for pre order or available for Kindles but I really hope that when it gets its official UK launch it gets some attention. Everything about this book is a treat. 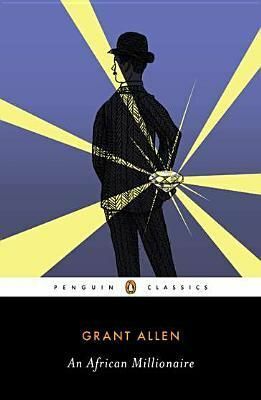 I love the cover design for the Penguin classic crime series, especially the use of matt and shiny finishes to differentiate light from dark. The story is good (more of that later) but the authorial voice is the thing. I'm not sure how a 'Classic' is officially defined, the ever expanding list of rediscovered 'lost classics' muddy the waters somewhat and the idea of an accepted, relatively static, canon begins to look ridiculous. For me personally what makes a book stand out from the vintage heard is the freshness of it's tone, when something makes me think how little, rather than how much, has changed it generally feels like it should be a classic. 'An African Millionaire' whilst being very much of it's time has that freshness. First serialised in 'The Strand' magazine in 1896 'An African Millionaire' has been widely regarded as the first to feature a criminal protagonist, literature's first gentleman rogue (or so it says on the back blurb). Actually there are three rogues - Seymour Wentworth the narrator who is a worldly man quite willing to put his own interests first, and not above pulling a fast one on his boss, and brother in law, Sir Charles Vandrift the African millionaire of the title. Sir Charles has the golden touch in business and seemingly no scruples at all, if non of his actions are specifically illegal most of his business dealings are of questionable morality if not specifically dishonest - and then there's his nemesis Colonel Clay, master of disguise and international con man. Colonel Clay has it in for Sir Charles Vandrift and is making it his mission to remove as much of the millionaires money from him as possible. If there's a hero it's Clay, but as hero's go he's not entirely satisfactory - he's to shadowy a figure, not even present in all the chapters. Wentworth is easier to relate to, he has his faults (a willingness to be bribed) but as the poor relation working for an unpleasant man it's hard not to sympathise with his little fiddles. Seeing Sir Charles through eyes that are partly tolerant of his practices makes the books pay off more effective - this is that if a rogue cheats a rogue he must still be punished regardless of who is the greater scoundrel. This is an attempt to show the shiny cover. Allen doesn't like his millionaires at all making this a timely reissue in the wake of the occupy movement, more importantly though it's a very funny book full of smart (if not entirely unforeseen) twists with an eye for detail. There is a bit more Allen in print and I'll be scouring Victorian anthologies for his short stories, I just wish I had more to hand because he turned out to be just the thing for lifting my current mood. After making a lot of fuss this week about the absolute necessity of a chocolate bunny for Easter (and turning up at his house with 3 bags of supplies for a 2 night stay) the Scottish one asked me if Easter had been a big thing in our house as children. 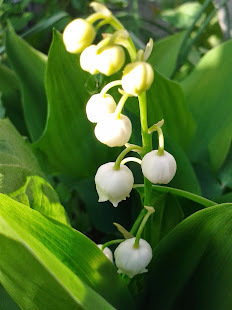 It wasn't as big a deal as Christmas but we always celebrated it and looking back my memories of Easter lack the baggage and disappointment attached to Christmas. I like the chocolate and the hot cross buns, I like that it can be a reason to have a big family celebration but that it's also acceptable to spend the day watching old films and risking diabetic coma. Winter made an unwelcome return today - when it wasn't raining it was snowing, and although I don't doubt the garden will be appreciative of all the water I would have preferred it if it had fallen on any other day of the week; day off plans were comprehensively washed and frozen out. It's not been a total loss though, there was some really very good carrot cake (from 'Short and Sweet' with added raisins, and I would say excellent but I never manage to get the cream cheese frosting just quite right) and a lamb and apricot pilaf from Claudia Roden's never yet beaten 'A New Book of Middle Eastern Food'. Inbetween the cooking and watching rubbish daytime telly there's also been some reading. Come to think of it that could have been a much worse day off. 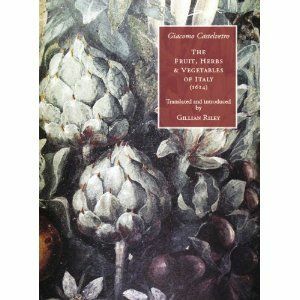 The book that's been reminding me of warmer climes today has been a classic of early 17th century food writing; 'The Fruit, Herbs & Vegetables of Italy' written by Giacomo Castelvetro, translated by Gillian Riley, and published by Prospect books. Castelvetro is an intriguing character, he had to leave Italy on account of his protestantism and the unwelcome attentions of the Roman Inquisition and spent much of his life travelling around Europe. He eventually returned to the charity of his friends in England but his last years don't seem to have been altogether happy. 'The Fruit, Herbs & Vegetables of Italy' was written late in his life and circulated in manuscript form to would be patrons including Lucy, Countess of Bedford (she who was a friend of John Donne). He was a passionate advocate of fruit and vegetables, and although not quite a vegetarian doesn't seem to be so far off. It's interesting (and entertaining) reading, Gillian Riley talks of how much she enjoyed Castelvetro's voice and I enjoyed what she did with it. His format follows each fruit or vegetable as it comes into season - something that's right back in vogue - and explains how it's cooked and eaten in Italy along with some of it's health benefits and occasional anecdotes. Perhaps because the things you can do to vegetables and salad haven't changed so very much this doesn't feel like an antique account (although modern cookbooks don't tend to focus quite so closely on cures for constipation and urine infections - at least not the ones I tend to consult - in this case it's endearing). What I found particularly interesting was an insistence on cleanliness; hands have to be thoroughly washed, the English, Germans, and French all do a poor job of washing salad - which again has to be done properly and then dried. There are frequent exhortations to make sure bowls are properly washed too, I think the modern cook would feel quite comfortable in Castelvetro's kitchen. There is also an excellent glossary which explains and expands on much of the text. I'm fascinated by culinary history - you wouldn't believe how excited I get about mince pies and Christmas pudding ever since I realised just how old they were - and the links with middle eastern cooking - that's the taste of history (and Christmas) which is quite exciting for something Mr Kipling makes. 'The Fruit, Herbs & Vegetables of Italy' has ensured I'll never take a salad for granted again. I have a number of Rose Macaulay books on the shelf but this is the first time I've managed to finish one (prodded by a reading group) and it's left me with mixed feelings. Once I'd started it (which I did slightly in the manner of a woman approaching a necessary but not entirely unpleasant chore) I had no trouble getting through it but I did have trouble in believing in it. There was a nagging feeling that Macaulay was working out something quite personal on the page, her characters felt like caricatures: Helen the amoral mother who is so beautiful (in the classical mould) that nobody can resist her charm - Helen the face that launches a thousand ships and cause turmoil wherever she goes. She could as well have been called Aphrodite. There is also Sir Gulliver her upright and uptight English ex husband, and Pamela his very fair play and jolly hockey stick new wife. Overshadowing it all is the ghost of Helens dead second husband Maurice, a Frenchman with Dionysian qualities. 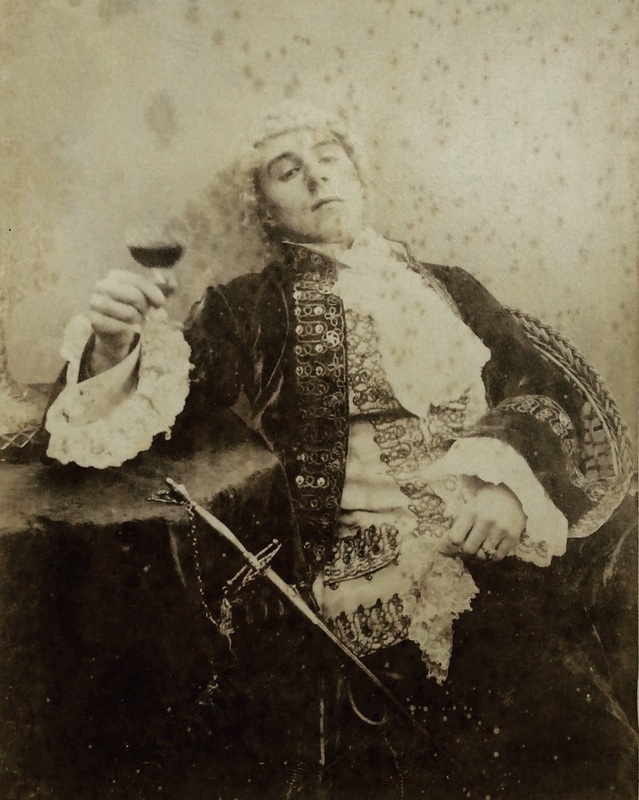 Their children include Ritchie, the son of Helen and Gulliver, who having made it through the war is intent on giving himself over to aesthetic indulgence, Raoul the son of Maurice and his un-regretted first wife, Barbary - the heroine of the novel and whose name immediately sets her up as a piratical mysterious creature most properly belonging to the jungle or other margins of civilised life - is also the product of Helen and Gulliver's marriage. The novel takes place in the immediate aftermath of the war, starting in Collioure in the south of France (famous for painters and wine) Maurice is meant to have collaborated with the Nazi's in a mild sort of way and despite using the fruits of his activities to help both his neighbours and escaping allied airmen the Maquis drown him (confusingly it seems that Maquis refers to the individual resistance fighter, the resistance movement as a whole, and also the country they retreat to hide in). Maurice's collaboration is the first weak point - it's described as such a half hearted affair, Helen escapes a similar fate because they helped those airmen, and Raoul and Barbary are involved with the Maquis. Maurice should have been a much more ambiguous figure, except as a plot device his death doesn't make sense. I questioned too Barbary and Raoul's involvement with the resistance - it may be that the movement was full of 14 year old girls taking pot shots at Nazi's but Barbary seems so childish that again except as a way of signposting her position on the margins of society it feels unlikely. Maurice's death at the hands of the Maquis forces Helen to send the children away to London where they quickly find another marginal landscape to inhabit - the ruins around St Paul's which have already been more than half reclaimed by nature. At this point the scene is set, the actors on their marks, and all that remains is for the action to play itself out to a conclusion of some sort. If it hadn't been for Macaulay's fine eye for detail and satire I would have struggled with this book but her descriptions of bombed out London are moving, and her descriptions of Pamela especially very funny. The examination of what war and family does to it's survivors is not, I think, entirely successful - it's to heavy handed. Worth mentioning as a post script though is that Macaulay's description of professional shoplifting strategy is masterly, the technique she describes hasn't changed in 60 years.